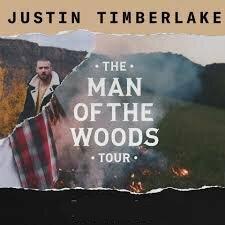 Timberlake's fourth studio album, Man Of The Woods, was released on Friday, February 2. Yesterday, he performed for the third time at the most watched musical event of the year, the Pepsi Super Bowl LII Halftime Show. Timberlake's last tour was the critically acclaimed The 20/20 Experience World Tour, which sold out arenas and stadiums around the globe in 2013 and 2014. American Express Card Members can purchase tickets before the general public. In North America for dates on sale to the general public on Monday, February 12, the American Express presale begins Wednesday, February 7 starting at 10 AM local time through Sunday, February 11 at 5 PM local time. For dates on sale to the general public on Monday, February 19, the American Express presale begins Wednesday, February 14 at 10 AM local time through Sunday, February 18 at 5 PM local time and for dates on sale to the general public on February 26, the American Express pre-sale begins Wednesday, February 21 at 10 AM local time through Sunday, February 25 at 5 PM local time. In Europe (where applicable) for dates going on sale Monday, February 12th the American Express presale begins Wednesday, February 7 starting at 10 AM local time through Sunday, February 11 at 5 PM local time (Friday, February 9th at 7 PM local time in France). In the United Kingdom, the American Express pre-sale begins Thursday, February 8 at 10 AM local time through Sunday February 11 at 5 PM. At every U.S. stop on The Man Of The Woods Tour there will be a VIP Verizon Up section, putting customers up close and personal to the stage and JT. Verizon Up, the company's loyalty program, is all about thanking customers through everyday rewards and exclusive experiences, like getting closer to the artists they love.